This workshop is organized by ATMOS group members; Bas van de Wiel, Sukanta Basu, Peter Baas, Steven van der Linden and Bert Holtslag from Wageningen University and Research. A new model is proposed on how to account for the inertia of scatterers in radar-based turbulence intensity retrieval techniques. Rain drop inertial parameters are derived from fundamental physical laws, which are gravity, the buoyancy force, and the drag force. The inertial distance is introduced, which is a typical distance at which a particle obtains the same wind velocity as its surroundings throughout its trajectory. For the measurement of turbulence intensity, either the Doppler spectral width or the variance of Doppler mean velocities is used. The relative scales of the inertial distance and the radar resolution volume determine whether the variance of velocities is increased or decreased for the same turbulence intensity. A decrease can be attributed to the effect that inertial particles are less responsive to the variations of wind velocities. An increase can be attributed to inertial particles that have wind velocities corresponding to an average of wind velocities over their backward trajectories, which extend outside the radar resolution volume. Simulations are done for the calculation of measured radar velocity variance, given a 3-D homogeneous isotropic turbulence field, which provides valuable insight in the correct tuning of parameters for the new model. An advanced method to estimate the specific differential phase (Kdp) and backscatter differential phase (dhv) from rain at X-band frequencies is proposed. The method aims to obtain high spatial resolution of Kdp and dhv estimators while controlling their inherent bias-variance dilemma. In addition, the variance of Kdp was mathematically formulated for quality control. This poster was awarded as the 3rd best student poster presentation. On Wednesday 29th October 2014 was the official kick-off meeting of Waterlab which took place in the Science Center of TU Delft (link1, link2). Almost 300 pupils from primary schools of Delft had a first hint about science and rain measurements. Currently, four primary schools in Delft area are involved in the project. The teachers and pupils measure local precipitations with handmade raingauges and compile all measurements to a dedicated website called MijnWaterlab. Besides these observations, rainfall intensities are also measured continuously since September 2014 with weather stations located in each of these schools (see picture on the right) in order to have a better idea about the variability of precipitation at the scale of a city. Easy comparisons can be made between each dataset. On the other hand, in the upcoming weeks, students from secondary schools from Delft will integrate the project and the roof of these lyceums will be equipped with a station for measuring rainfalls. The students there will have to deal with scientific projects in relation with the analysis of these observations. 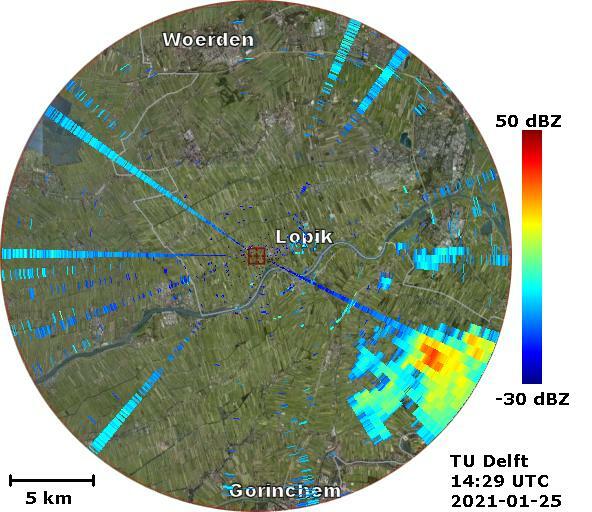 Since today, another weather station is also located in the Science Center to continue with the densification of the network of stations in Delft. The particularity of this station is that the data are collected automatically via wired internet connection with the use of a RaspberryPi-based system (see picture on the right) that was under development during the last months. A quasi-similar configuration (using 3G wireless internet connection) will be applied very soon to the stations installed in schools (currently a visit to each school is needed to manually collect the data). One day before the conference, there were full day workshops to reinforce our knowledge related to Doppler spectra, rainfall estimation, and open radar data source. The ERAD 2014 was held in the beautiful mountain city called Garmish-Pathenkirchen. The conference last for 5 days inviting multi-national researchers for productive discussions through oral and poster presentations. Besides scientific talks, the conference organized several events such dinner and excursions so that everyone can have a nice chance to get to see familiar faces and/or know new ones. In particular, for me it was nice to see again friends from the University of Oklahoma such Bob Palmer, Tian Yu, Sebastian Torres, and Brad Isom. Also, very close friends from the EPFL in Switzerland Jacopo, Tim, and Marc. We all shared interesting discussions about radar meteorology of course but also a good and friendly talks along with typical Bavarian food such bretzel and withe sausages and Schweinebraten as shown in the pictures below. ERAD 2016 will be hold at Antalya in Turkey promising very good weather near the beach. Tian Yu and Alexander Ryzhkov announced that the next AMS Radar Conference will take place in Oklahoma, USA, where we will be able to see very advanced laboratories facilities for weather radar applications. From 8th to 17th September 2014, the 2nd Summer School of the ITaRS community took place in the Institute of Energy and Climate Research (IEK) at the Research Center of Jülich (Germany). Dimitra, Edouard and Lukas participated to the summer school. We had the opportunity to meet academia and industrial experts of the clouds and precipitation remote sensing community. The lectures were very interesting and led to fruitful discussions between fellows and all the invited partners. Besides attending the lectures, we also worked on challenging team projects by using measurements from the instruments of the ground-based JOYCE station. Lukas’s team won the right to take part to the upcoming TOPROF workshop in Copenhagen, Denmark (18-20 November 2014). It was very nice to see again all the fellows. Once we spent a nice evening in beautiful Cologne. The summer school was also about sports: we played once a football match and we were cycling every morning and every evening between our hotel downtown and the research center. EuCAP 2014 – The 8th European Conference on Antennas and Propagation, has been held at the World Forum in The Hague, The Netherlands, on 6-11 April 2014. Our colleague Yunlong Li, presented his paper entitled “Radar Observations and Modeling of Fog At 35 GHz“. This is the first time that a 35 GHz cloud radar at the Cabauw Experimental Site for Atmospheric Research in the Netherlands has been used for fog measurements. However, measuring fog with cloud radars is still a challenge in technical issues. Any suggestions and collaborations are welcome if you are interested in fog radar. On 18-06-2014 the CESAR-scienceday 2014 took place at KNMI. During this meeting the whole spectrum of scientific research related to the research side in Cabauw (CESAR) was presented. The ATMOS group contributed with two posters (L. Pfitzenmaier and Y. Li) and two presentations (A. Oude Nijhuis and L. Pfitzenmaier). During this Meeting also the upcoming measurement campaign ACCEPT (Analysis of the Composition of Clouds with Extended Polarization Techniques). All the other presentations and posters will be available soon at the webpage of the CESAR science day 2014 soon.